Hidden cameras are usually designed to look like regular household items, such as wall clocks, tissue boxes, or even plants, and can sit discreetly without calling attention to the fact that it is a hidden camera capturing footage of what happens in its field of view. Hidden cameras may also be designed to look like more industry-friendly objects as well, such as lighted exit signs or security lights, making it possible to enable undercover surveillance in nearly any setting, whether a home, office, or warehouse. For users who don’t find a form factor that suits their space, we also carry plain black box cameras that can be inserted into nearly any hollow object, turning it into an effective hidden camera for monitoring your space. Hidden cameras have a variety of uses, whether to allow homeowners to monitor their property and integrity of their in-house workers while they’re away, to enable business owners to keep tabs on who is coming and going at the office, or to ensure that existing security systems are not harboring any blind spots where activities may go unnoticed. Hidden cameras are most commonly used in spaces where the user doesn’t want anyone to know they are being watched. This may be effective for office managers who suspect that their employees are rifling through their office when they are away, or parents who want to make sure that their nanny or housekeeper is doing their best work. No matter what your concern is, a hidden camera is a discreet way to watch what’s happening without raising suspicions. Hidden cameras may also be used to effectively cover blind spots in existing security systems. For example, if your security cameras can see nearly every area in your retail store or warehouse, but there are dark corners where they cannot see, these areas become hotbeds for theft opportunity. Hidden cameras can be placed in these areas to help you catch dishonest employees or customers in the act of hiding merchandise for later retrieval and theft. Hidden cameras may also come with a variety of features, including remote viewing capabilities, motion detection alerts, night vision, and more, to ensure that you never miss a beat of what happens on your property while you’re away. If you need help choosing the most appropriate hidden camera style for your space or the best features for your needs, the BrickHouse Security team is always available to help. Hide them in anything or hide them in plain sight. 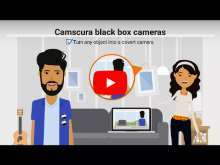 Incredibly sophisticated, yet easy to set up and use, the Camscura family of black box hidden cameras lets you create your own covert recording device. These hidden cams fit easily into almost any common household object -- or choose one of our custom housings specifically designed for select Camscura models. Leaving your child in the care of a nanny or babysitter takes a great deal of trust. BrickHouse nanny cams give you the reassurance and peace of mind you need. Choose the right hidden camera to blend into your home and lifestyle — many under $100. You won’t find a larger selection of nanny cams anywhere. In any room of your home or office, odds are you'll find a clock — which makes clock cams the perfect home hidden camera form factor. No matter the decor or functionality you're looking for, there's a solution for you, from remote view alarm clocks to sleek wall clocks and much more. Featuring extended battery life and weatherproof construction, outdoor hidden cameras are the ideal solution for monitoring the exterior of your home or office. Choose from a number of covert form factors to protect your property against vandals and thieves — or watch crisp footage of the wildlife that visits your house while you’re away. Discerning criminals or domestic employees who spend time in your home every day know exactly where your security cameras are. By adding hidden cameras to your system, you can cover blind spots that would otherwise go unwatched. Choose from a number of hidden cam form factors to keep suspects guessing. Hidden in glasses, hats, and buttons, wearable cameras are the best way to record covert video on the go. Perfect for secret shoppers, extreme sports athletes looking to document their adventures, or recording everyday events, these versatile hidden cameras capture everything you see from your unique point of view. Most hidden cameras rest on a shelf or a desk, or hang on a wall. What sets smoke detector hidden cameras apart is their location; with a wide viewing angle and ceiling mount, these covert cameras cover a much wider area of surveillance. And, because they fit in anywhere, they're perfect for both home and business monitoring. Retail loss is a billion-dollar industry and it's only getting bigger. By incorporating hidden cameras into your store surveillance system, you prevent people who know where your cameras are located from exploiting weak spots. Choose from a number of camera models, or select a simple black box hidden camera for portable, covert recording.